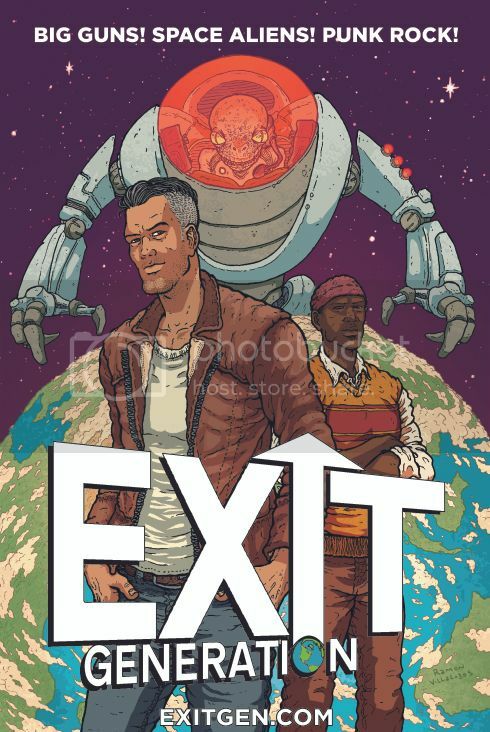 Travelling Man review ‘Exit Generation #1’! And you can find issues #1-3 at all their stores now! In 2035, a generation long evacuation of the planet launched. The EXIT Project was designed to evacuate all of humanity to a new world. It went wrong before it even launched, with only 95% of the planet’s population able to fit aboard the ships. The other 5% were left behind. Jack’s mother, pregnant with him, was one of them. Jack’s father was aboard the ships. The 5% watched in horror as a fault in the oxygen systems on all the ships wiped out everyone aboard. There was nothing they could do, no rescue possible. 95% of the planet’s population died due to a simple error. In 24 hours time, after a train ride that takes me across the north of the UK, & a short hop over the Irish Sea, I will be at what is probably my most anticipated comic event of 2014; Dublin International Comic Con (DICE). As that time draws closer I’ve got increasingly excited, but also kind of nervous. & on the eve of my journey I wanted to lay out the ‘Why‘ behind both of those feelings. Firstly, “excited“; this one is easy! Look at that guest list for a second… Stunning, no? Any right-minded comic fan can see that the team at Big Bang, along with creative director & artist extraordinaire Declan Shalvey, have assembled a mighty group of creators & industry figures, both from Ireland & across the world. If you’re reading anything from the Dark Horse Mignolaverse books (Maura McHugh of Witchfinder) to Adventure Time (Kate Leth) to the most celebrated Image books (McKelvie & Gillen of Wicked+Divine), then there is likely at least one (more likely many) folk you’d want to get a something signed by, buy something from or even just shake hands with. On top of this, the panels at DICE are some of the best I’ve ever attended (take a look if you don’t believe me), & I cannot recommend them highly enough. Be your interest in just finding out more about your favourite titles/creators, or seeking hints & tips on your burgeoning art or writing efforts, then you really are spoilt, not only for choice but by the quality on display. Last year at DICE I attended as one of those folks who, when asked about his own efforts in comic creating, would say “oh, yeah; I’m working on something…” & was entirely unable to back that up. It was true & I was lucky enough that one of my collaborators at the time, Ruth Redmond, was kind enough to put me up, & introduce me to a number of wonderful folks in the Irish comic scene (& beyond), many of whom I am (again) lucky enough to keep in touch with now. But that fact that I had nothing to back up my claims struck deep. Many of the professionals I was fortunate enough to get advice from had one, crystal-clear message about what had put them on the path to where they were now; “make comics“. They said this in private & in public, as shown in this excellent video of the ‘Breaking into Comics’ panel (& yes; that is me towards the end…), & the message was clear; if you wanted be involved in creating comics, don’t wait for permission, just go & do it. That message struck me deep. Deep enough that across the year since DICE 2013 I’ve taken that advice & run with it, resulting in rather that just attending as a fan this year (I’m still VERY much a massive fan, make no mistake) I am also exhibiting (you’ll find as RF Comics here), with the first three issues of Exit Generation available for folks to buy, with the fourth & final instalment landing very, very soon. So… I’m nervous because despite this convention not even being in my home country, it kind of feels a little bit like a homecoming of sorts, & I just hope that folks attending like what I was inspired to do 12 months ago, & that perhaps my little story, along with the incredible event that DICE is can light a similar fire under someone else this time.